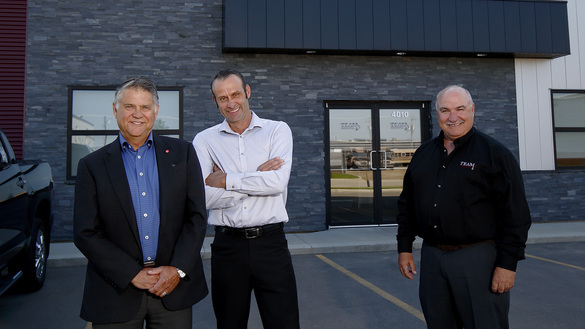 Before they joined forces to create the company Team Drilling in 2008, Al Lamy, George Presseault, Robert Fleming and Sylvain Brisson each had over 20 years of direct experience working for major companies in the drilling industry. They had a vision to lead their own venture. Thanks to a strategic partnership with Athabasca Basin Development, these men were able to turn their dream into a reality. The Athabasca Basin is a region in the Canadian Shield of northern Saskatchewan and Alberta that contains the world's leading source of high-grade uranium (currently supplying around 20 per cent of the world's demand). Athabasca Basin Development is an Aboriginal-owned investment company committed to building and investing in successful businesses that are creating work opportunities in the region. Recently, Team Drilling purchased the assets of another Saskatchewan-based diamond drilling company and brought the former owner Glen Sigstad on as a partner with the company. Fleming noted that while the company’s partnership with Athabasca Basin Development may have provided the necessary start-up funds, the benefits have quickly expanded to the Aboriginal communities in northern Saskatchewan. Athabasca Basin Development is owned by the seven communities in the Athabasca area, including Hatchet Lake, Black Lake, Fond du Lac First Nation, Stony Rapids, Wollaston Lake, Uranium City and Camsell Portage, providing an efficient way to partner with these local communities in one of the world’s premier mining and exploration districts. With Athabasca Basin Development owning 50 per cent of the Team Drilling operation, there are many benefits that flow back to these communities. Team Drilling also utilizes upwards of 50 per cent Indigenous workers on a number of projects it works on in northern Saskatchewan. Team Drilling offers mineral exploration services to groups ranging from junior mining companies to major operations. Team Drilling provides core samples from the exploration point, and then the clients can analyze it and decide if there’s need for a mine or further underground or surface drilling. The company’s flagship project has been working at Cameco’s Cigar Lake site, the world's highest grade uranium mine. Team Drilling has been assisting with a mining technique called jet boring, where the ore and surrounding rock is frozen. Brine, chilled to -40C, is piped underground to the deposit. Fleming said that since Team Drilling was awarded a contract for the project in 2011, it has focused on streamlining the process and has decreased its number of drills from five to three while still meeting deadlines. Team Drilling has also been operating four drills on SSR Mining Inc.’s Seabee gold mining operation, 125 kilometres northeast of La Ronge. The company has recently begun a $90 million expansion that it hopes will boost production, cut operating costs and extend the operation’s lifespan into the mid-2020s. It also provides drilling services for many exploration projects operated by Orano Canada Inc., another Saskatchewan based mining company. Fleming said that working in northern Saskatchewan provides some interesting challenges. The company is often working underground in high water pressure zones and must operate with specialized equipment. For remote work, the company will fly its equipment out and move around drills with helicopters. The company has drilled on frozen lakes and drilled off barges in the summer. These conditions make safety a major focus for Team Drilling. Fleming said “safety comes first in all activities” and the company continually assesses, investigates, evaluates and improves its safety systems, including investing in up-to-date safety equipment. The company has signed WorkSafe Saskatchewan’s Mission: Zero charter and the company’s drillers have numerous safety certifications. Team Drilling is also committed to not disturbing the environments it works in. The company complies with applicable environmental laws and includes environmental considerations as an integral part of its planning process. “As a responsible corporate citizen, we consider ourselves to be an environmentally-friendly company, and as such, we are committed to minimizing the impact of our activities on the environment while managing our operations economically, safely and efficiently,” Fleming said. Team Drilling has had the opportunity to manage projects outside of northern Saskatchewan, including a diamond mine in the North West Territories. The company also operated six drills for the Rio Tinto Iron Ore group in Labrador. Fleming said the company has been receiving requests to provide tenders throughout all of the province and territories and has also been exploring overseas projects. While Team Drilling is exploring projects away from home, it’s clear that the company doesn’t need to dig further than northern Saskatchewan to strike gold. “Each of us came from different areas when we started the company. Some of us were born and raised in Saskatchewan,” Fleming said.